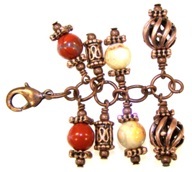 Red Jasper Drop (10 total Drops) – Add 1 –Antique Copper 3mm Round, 1 – Antique Copper 6x2mm Snowflake Rondelle, 1 –Red Jasper 8mm Round, 1 – Antique Copper 6x2mm Snowflake Rondelle, and 1 – Antique Copper 3mm Round to an antique copper headpin. Make a 90° bend in headpin above beads. Using round nose pliers (or any pliers you have) hold the headpin near the angle and bend it around the pliers to make a loop. Wrap down around headpin creating as many coils as you can. Trim any extra. Repeat 9 times. Crazy Lace Agate Drop (10 total Drops) – Add 1 – Antique Copper 3mm Round, 1 – Antique Copper 6x2mm Snowflake Rondelle, 1 – Crazy Lace Agate 8mm Round, 1 – Antique Copper 6x2mm Snowflake Rondelle, and 1 – Antique Copper 3mm Round to an antique copper headpin. Make a 90° bend in headpin above beads. Using round nose pliers (or any pliers you have) hold the headpin near the angle and bend it around the pliers to make a loop. Wrap down around headpin creating as many coils as you can. Trim any extra. Repeat 9 times. Decorative Tube Drop (11 total Drops) – Add 1 – Antique Copper 3mm Round, 1 – Antique Copper 9x5mm Decorative Tube, and 1 – Antique Copper 3mm Round to an antique copper headpin. Make a 90° bend in headpin above beads. Using round nose pliers (or any pliers you have) hold the headpin near the angle and bend it around the pliers to make a loop. Wrap down around headpin creating as many coils as you can. Trim any extra. Repeat 10 times. Spiral Round Drop (8 total Drops) – Add 1 – Antique Copper 3mm Round, 1 – Antique Copper 6x2mm Snowflake Rondelle, 1 – Antique Copper 10mm Spiral Round, 1 – Antique Copper 6x2mm Snowflake Rondelle, and 1 –Antique Copper 3mm Round to an antique copper headpin. Make a 90° bend in headpin above beads. Using round nose pliers (or any pliers you have) hold the headpin near the angle and bend it around the pliers to make a loop. Wrap down around headpin creating as many coils as you can. Trim any extra. Repeat 7 times. 1. Open one 8mm jump ring and add the loop of the lobster clasp and one 5mm jump ring. Close the 8mm jump ring. 2. Open one 8mm jump ring, add one Red Jasper Drop, the 5mm jump ring you added in Step 1, another Red Jasper Drop, and one 5mm jump ring. Close the 8mm jump ring. 3. Open one 8mm jump ring, add one Decorative Tube Drop, the 5mm jump ring you added in Step 2, another Decorative Tube Drop, and one 5mm jump ring. Close the 8mm jump ring. 4. Open one 8mm jump ring, add one Crazy lace Agate Drop, the 5mm jump ring you added in Step 3, another Crazy Lace Agate Drop, and one 5mm jump ring. Close the 8mm jump ring. 5. Open one 8mm jump ring, add one Spiral Round Drop, the 5mm jump ring you added in Step 4, another Spiral Round Drop, and one 5mm jump ring. Close the 8mm jump ring. 6. 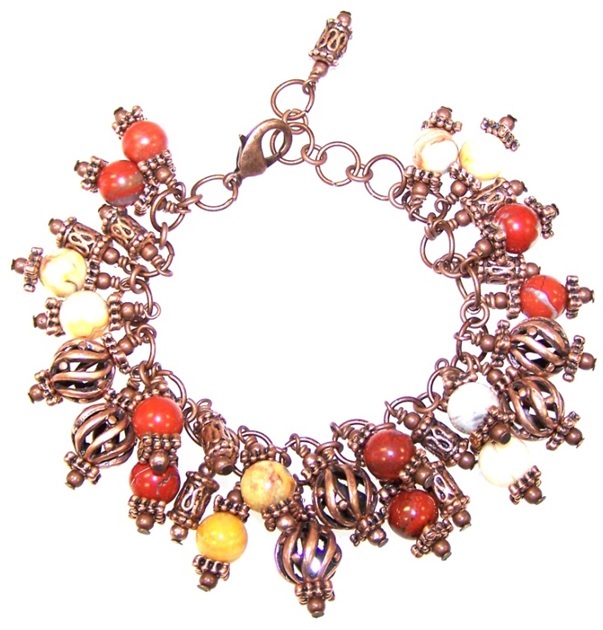 Open one 8mm jump ring, add one Red Jasper Drop, the 5mm jump ring you added in Step 5, another Red Jasper Drop, and one 5mm jump ring. Close the 8mm jump ring. 7. Open one 8mm jump ring, add one Decorative Tube Drop, the 5mm jump ring you added in Step 6, another Decorative Tube Drop, and one 5mm jump ring. Close the 8mm jump ring. 8. Open one 8mm jump ring, add one Crazy lace Agate Drop, the 5mm jump ring you added in Step 7, another Crazy Lace Agate Drop, and one 5mm jump ring. Close the 8mm jump ring. 9. Open one 8mm jump ring, add one Spiral Round Drop, the 5mm jump ring you added in Step 8, another Spiral Round Drop, and one 5mm jump ring. Close the 8mm jump ring. 10. 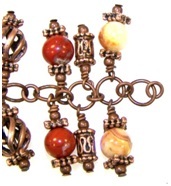 Open one 8mm jump ring, add one Red Jasper Drop, the 5mm jump ring you added in Step 9, another Red Jasper Drop, and one 5mm jump ring. Close the 8mm jump ring. 11. Open one 8mm jump ring, add one Decorative Tube Drop, the 5mm jump ring you added in Step 10, another Decorative Tube Drop, and one 5mm jump ring. Close the 8mm jump ring. 12. Open one 8mm jump ring, add one Crazy lace Agate Drop, the 5mm jump ring you added in Step 11, another Crazy Lace Agate Drop, and one 5mm jump ring. Close the 8mm jump ring. 13. Open one 8mm jump ring, add one Spiral Round Drop, the 5mm jump ring you added in Step 12, another Spiral Round Drop, and one 5mm jump ring. Close the 8mm jump ring. 14. Open one 8mm jump ring, add one Red Jasper Drop, the 5mm jump ring you added in Step 13, another Red Jasper Drop, and one 5mm jump ring. Close the 8mm jump ring. 15. Open one 8mm jump ring, add one Decorative Tube Drop, the 5mm jump ring you added in Step 14, another Decorative Tube Drop, and one 5mm jump ring. Close the 8mm jump ring. 16. Open one 8mm jump ring, add one Crazy lace Agate Drop, the 5mm jump ring you added in Step 15, another Crazy Lace Agate Drop, and one 5mm jump ring. Close the 8mm jump ring. 17. Open one 8mm jump ring, add one Spiral Round Drop, the 5mm jump ring you added in Step 16, another Spiral Round Drop, and one 5mm jump ring. Close the 8mm jump ring. 18. Open one 8mm jump ring, add one Red Jasper Drop, the 5mm jump ring you added in Step 17, another Red Jasper Drop, and one 5mm jump ring. Close the 8mm jump ring. 19. Open one 8mm jump ring, add one Decorative Tube Drop, the 5mm jump ring you added in Step 18, another Decorative Tube Drop, and one 5mm jump ring. Close the 8mm jump ring. 20. Open one 8mm jump ring, add one Crazy lace Agate Drop, the 5mm jump ring you added in Step 19, another Crazy Lace Agate Drop, and one 5mm jump ring. Close the 8mm jump ring. 21. Open one 8mm jump ring, add one 5mm jump ring and the 5mm jump ring you added in Step 20. Close the 8mm jump ring. 22. Open one 8mm jump ring, add one 5mm jump ring and the 5mm jump ring you added in Step 21. Close the 8mm jump ring. 23. Open one 8mm jump ring, add one 5mm jump ring and the 5mm jump ring you added in Step 22. Close the 8mm jump ring. 24. Open one 8mm jump ring, add one Decorative Tube Drop and the 5mm jump ring you added in Step 23. Close the 8mm jump ring. You are done! These instructions make a bracelet that is adjustable up to 9 inches long. 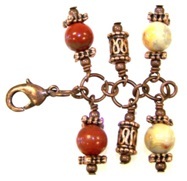 Just attach the lobster clasp to the 8mm jump ring that is the right fit for you!